It ain't over until it's over. Right. And it is not over. Let me tell you what a joy it is to live in the great state of Missouri, where state lawmakers don't realize that this is a democracy. According to several news sources Missouri legislators don't care what the people think. Missouri lawmakers, in both the House and Senate, say they will support efforts by dog breeders and agricultural groups to repeal or dilute Proposition B, the Puppy Mill Cruelty Prevention Act, passed by voters November 2. "We will start working on that issue immediately," said Senator-elect Mike Parson, whose district includes more than 150 licensed breeding operations. The next legislative session begins Jan. 5. Proposition B, which will put new restrictions on state dog breeders, passed by substantial margins in urban areas, but failed in 100 of the state's 114 counties. Overall, it got 51.6% of the vote. 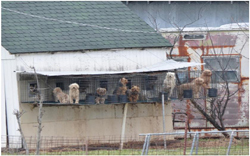 The puppy mill lobby, largely represented by rural Missouri interests, is screaming about the narrow margin of passage. According to Representative Tom Loehner, chairman of the Missouri House Agriculture Policy Committee: "We're in discussions with a few people and trying to get together with ag groups, representatives and senators and also our legal people on exactly what we can do and what our options are." These are the same people who talk quite a bit about "the will of the people." Seems they see no disrespect for the people and democratic process in rejecting a majority of Missouri voters who voted in fabor of legislation requiring dog breeders to provide animals with adequate space, food, water, exercise and medical care. The way they see it: The measure failed in more than 100 of the state’s 114 counties, so the vote shouldn’t count. Huh? Since when did issues become decided by a county by county vote? Last time I checked, Missouri was a constitutional democracy and statewide initiative referendums were decided by a majority of state voters. As this one was. We voted. The majority rules. Or at least it is supposed to. Representative Tom Loehner is the genius who has stated many times that Proposition B will lead to 'the elimination of all agriculture'. Tell that to Purina and Monsanto and Frank Perdue. If you follow this USDA report link, you can see exactly what is going on in Missouri. Thanks for the link, Terry. Unfortunately, I'm aware of a couple of these operations; one in my county of residence. Though it is no longer licensed, they are still selling puppies. Readers, beware. You'll see graphic photos of deceased dogs not properly disposed of.